The West Buttress of Denali is definitely one of the most classic mountaineering routes up one of the most iconic mountains in the world. From the beautiful position deep in the rugged Alaska Range to the chance to tag the tallest mountain in North America, an expedition to Denali is in no way easy, but the rewards vastly outweigh the effort. I’ve guided the route three times, and I know from experience that nothing can fully prepare you for the West Buttress, but getting in good shape, and exercising your “suffering threshold” can help get you ready. Here are some pages out of my training regimen for the Great One. I think most experienced Alaska Range climbers would agree that you never really know what you are going to get. As far as conditions and weather are concerned, the best thing you can do is try to have no expectations. You can learn about trends in the weather, and conditions on the glacier via word of mouth or the internet, but considering that the average guided West Buttress trip takes 18-21 days, there is much that can happen once you’re fully committed. An adage I find myself using a lot is that it is either “freeze or fry” out there- there is no middle ground. While being too hot can be an issue, for most people being too cold is much more formidable. You can train yourself to function in the cold pretty easily, however. If you live in a cold-weather winter climate, go camping! Functioning in the cold isn’t ever too pleasant, but by gaining some experience with it you can gain the mental fortitude to make it work. See one of my previous POSTS for some winter camping advice. If you don’t have access to a cold winter climate, one exercise that will help increase your cold threshold is to put your hands in ice water until you can’t stand it anymore, then try doing various activities such as tying knots, knitting, cooking dinner, etc. This exercise is pretty limited however; the best thing you can do is either head to a cold climate for a winter camping excursion (at least one!). As far as physical exertion goes, you should expect to carry packs weighing up to 70 lbs, while hauling a sled loaded with up to 80 lbs of gear. Fortunately most programs will work off of a double carry system wherein the majority of days up to 16,000ft will only require carrying a fraction of that weight (an average of 50 lbs). While the lower half of the route is at a fairly moderate pitch, the upper half can be quite steep, requiring precise footwork and a steady pace at altitude in order to stay warm. No day's gain is more than around 3000ft in elevation, but climbers should be prepared to be moving 2 or 3 days in a row in between rest days. I have tried to ask most of the guests I’ve had on the West Buttress what training program they used to get in shape. I’ve heard everything from pulling tires around the cul-de-sac to a steady diet of mountaineering and backpacking to “nothing in particular.” What we generally tell people at the Institute is that any regular physical activity focusing on cardio is decent, but there are some specific activities that are better than others. 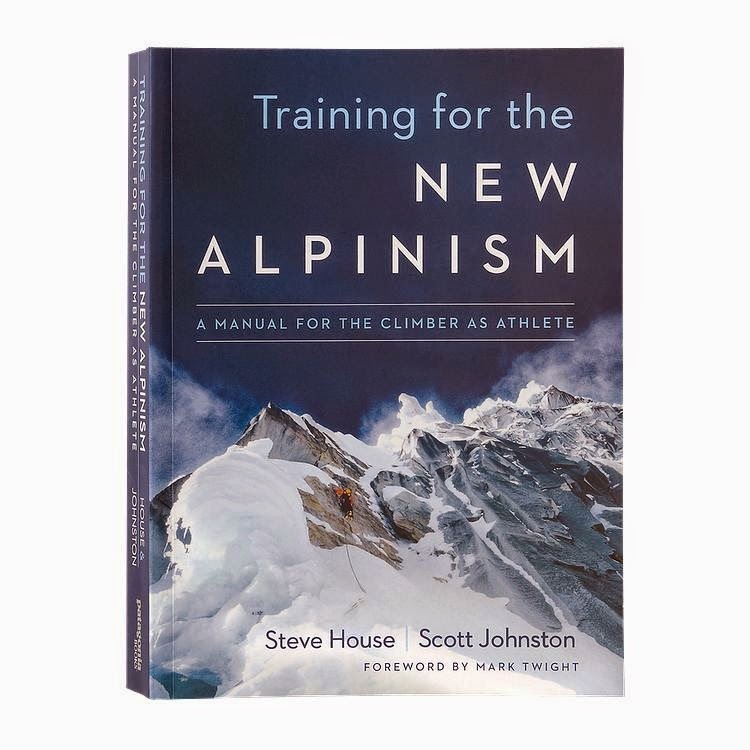 "Training for the New Alpinism", by Steve House and Scott Johnson is by far the best training manual I've come across. Unlike others in its genre, it isn't too heavy on technical jargon, and written in a way that laymen can understand. While it is written with the cutting edge, high-altitude athlete in mind, the book is very helpful for the basic level alpinist as well, and the training plans and exercises outlined are easily transferred for easier objectives (such as the West Buttress) than Steve House and company attempt. Picking up a copy of this book should definitely be the first step for the prospective Denali climber. The West Buttress also requires a decent amount of upper body and core strength. I recommend doing a separate routine for each, twice a week. Again, start slow (1 set per session, and add reps per week)! You aren’t going for max strength here, instead building endurance for the long haul (up the section of fixed lines that is!). The routines I use can be found in “Training For The New Alpinism,” or many variations can be found online- but try to find a mountaineering-specific one. One of the benefits of spending the extended time required for a double-carry strategy on the West Buttress is that it allows most people a chance to acclimatize as much as possible before we head to the upper mountain. 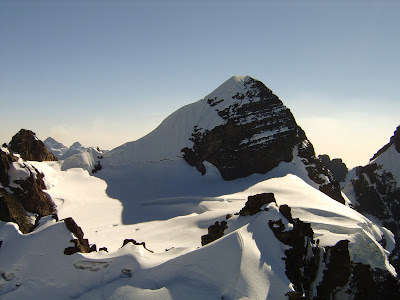 By doing “double-carries” (ferrying loads higher on the mountain while returning to a lower camp to sleep), you can maximize your acclimatization time. So, theoretically, you can just show up in Talkeetna without getting any acclimatization experience. In fact, unless you are consistently living at 10,000ft, there really isn’t much you can do that will gain you the high altitude experience needed, since any acclimatization built through periods at altitude quickly disappears upon returning to sea-level. The best thing you can do to be ready for high altitude is to make sure you are in good cardiovascular shape. Supplementing your weighted pack training with an activity such as swimming, running, or biking is a great way to increase your cardio and lung capacity. I find mountaineering-specific benefit in trail running, as you are not only building cardio fitness, but also training your leg muscles to handle stress. I repeat: start slow and don’t overdo it! Listen to your body first and foremost; it is always better to skip training days if you still feel tired than overdo it and risk injury. An expedition to the Alaska Range, whether guided or not, should never be attempted without at least a basic level of mountaineering knowledge or experience. The Range is home to some huge glaciers and unforgiving terrain. Walking and climbing in crampons, ice-axe arrest, roped travel, and crevasse-rescue techniques should all be very familiar to the prospective West Buttress climber. There is no substitute for actual glaciated travel here in my opinion. 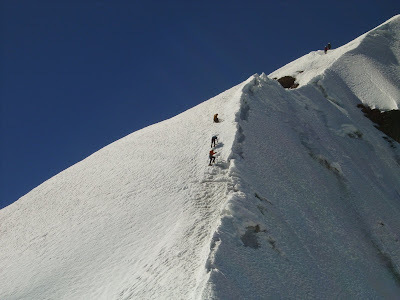 Basic mountaineering routes on any of the Cascade volcanoes are great pre-requisites, and my favorite has to be Mt Baker, where you can get a wide variety of easily-accessible training and climbing in. By far the best way to gain specific experience for the West Buttress is to take the Denali Prep Course offered by the Institute, which will provide broad mountaineering instruction, as well as winter camping and backcountry travel skills. Peak season is fast approaching for climbing the West Buttress, so if you are planning on heading north, now is the time to make sure you are in the best shape possible. I highly recommend picking up a copy of “Training for the New Alpinism” and entering into the training program the book outlines. If you have any specific questions, or would like help designing a program that tailors to your specific goals and time constraints, feel free to contact usat the Institute. One of the most confusing elements for a new climber is how the climbing class and grade systems work in the United States. Many individuals go to the rock gym and feel like they understand what a 5.7 feels like, but seldom understand where that grade came from. Many wonder why it's not simply a 2 or a 3 instead of a 5.7. Class 1 - Hiking on a maintained trail. Class 2 - Easy scrambling. Some may occasionally need their hands.Class 3 - Moderate scrambling. Hands may be employed more often. Class 4 - Easy climbing. Hands are used all the time. Many will climb at this level without a rope. Class 5 - Where real rock climbing begins. Technical equipment is employed at this level. Currently 5.15b is the hardest grade climbed in the world. However, the system is open-ended and one day somebody will climb something that is 5.15c. Though climbers strive for consistency in grades, this breakdown is often quite subjective. 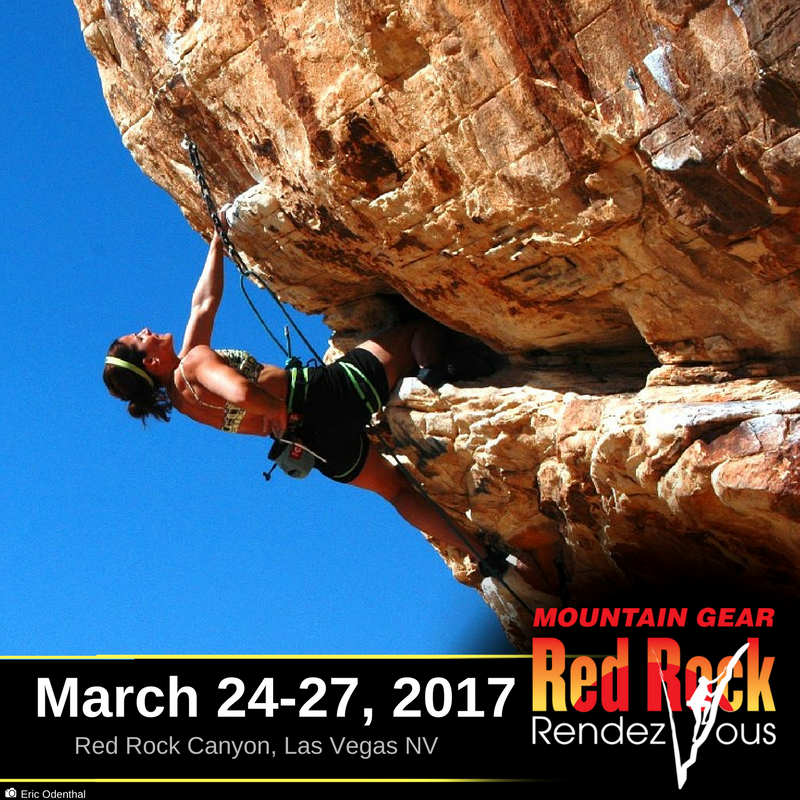 In other words, a 5.10a in Red Rock Canyon might be the equivalent of a 5.8 in Joshua Tree National Park. It's important for climbers to get a feel for how the grades work in every new area they visit before pushing themselves too hard. Grade I - A very short route requiring one to two hours. Grade II - A route that takes two to four hours. Grade III - A route that takes the better part of a day. For slower parties a Grade III will be an all day endeavor. Grade IV - A route that takes all day. Generally a day that requires in excess of 12 hours. The technical difficulties are more pronounced. Grade V - Generally takes more that a day. There are clear technical difficulties to be overcome. 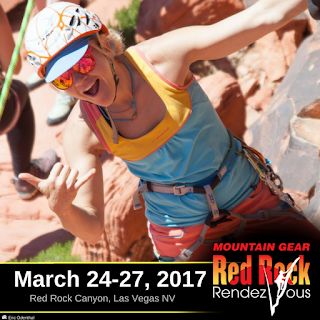 Grade VI - A multi-day climb that requires solid technical skills and often requires both aid and free climbing techniques. As with the Yosemite Decimal System, the commitment grade system is not without problems. It is incredibly subjective. The Nose on El Capitan in Yosemite is a Grade VI. When it was first climbed in 1958, it took 45 days. The speed record is currently under three hours and many parties complete the route in a day. So the question must then be asked, what is an "average" climber? How should these grades be set? Most guidebook authors will look for some kind of consensus. The real average party on the Nose still takes about four days. As such, the Grade VI will remain for the time being. Wag Bags are a brand name. These are actually waste bags. And there are several brands on the market, including Biffy Bags and Restop. --Hood River News is reporting that, "The search for a missing skier, Steve Leavitt from The Dalles, has been dialed back and termed a recovery effort. Leavitt, 57, has been missing at Mt. Hood Meadows since last Tuesday." To read more, click here. 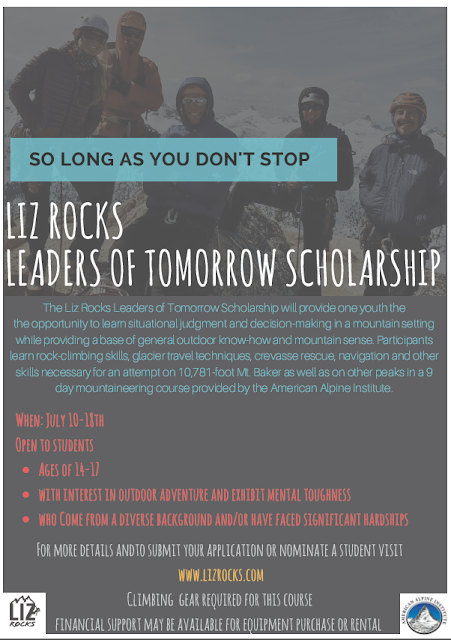 --The American Alpine Institute will be working with the Liz Rocks campaign to provide a scholarship for our Leaders of Tomorrow program for youth who come from a diverse background or who face significant hardship. The Leaders of Tomorrow program is the American Alpine Institute's premiere program for young people who wish to become climbers and mountaineers between the ages of 14 and 17. To learn more, click here. --Leif Whittaker is a mountain climber, photographer, and writer whose work has appeared in various media worldwide, including Powder, Backcountry and The Ski Journal. His first book, My Old Man and the Mountain, was published by Mountaineers Books in October, 2016. In this presentation on March 30th in Bellingham, Whittaker, son of the first American to summit Mount Everest, will shed light on growing up in the shadow of a famous father, and how that journey helped shape a unique view of his own relationship with a mountain and a dad. Whittaker will be available after the presentation to sign books. Coffee and cookies will be served. 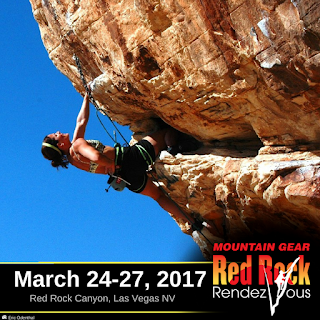 Registration for this event closes on March 27, 2017. To learn more, click here. --On Wednesday night, Climbing magazine posted an obituary for one of the greatest rock climbers of all time. "On Tuesday, March 14, California rock-climbing and big-wall pioneer Royal Robbins passed away at age 82. Born February 3, 1935, Robbins ushered in the development of many modern free- and aid-climbing techniques and standards. In 1952, Robbins made the first free ascent of the Open Book in Tahquitz, California, pushing free climbing standards to 5.9. Five years later, he, Jerry Galwas, and Mike Sherrick completed the first ascent of the Northwest Face of Half Dome over five days." To read more, click here. --It appears that there was a fatal climbing accident in Arches National Park on March 5th. There is limited information about what happened. To read more, click here. --This could be good news in the ongoing fight to stop development near Red Rock Canyon. The Nevada Independent is reporting that, "In the wake of controversy surrounding a proposed development within eyesight of the Red Rock Canyon National Conservation Area, Nevada lawmakers have reintroduced a bill that would essentially freeze any private development within a five-mile radius of a national conservation area. Democratic Assemblyman Steve Yeager introduced AB277 on Friday, with a large number of Democrats and two Republicans — Sen. Becky Harris and Assemblyman James Oscarson — signed on as sponsors." To read more, click here. --The Denver Post is reporting that, "Colorado’s Rocky Mountain National Park finished off 2016 as the nation’s fourth most popular national park with more than 4.5 million visitors. ": To read more, click here. --A death due to a ski lift malfunction has heightened awareness of ski area infrastructure needs in Colorado. To read more, click here. --CBC News is reporting that, "A 34-year-old man who died Sunday while skiing at Canada's Lake Louise was wearing a helmet when he crashed into a tree, RCMP said Monday." To read more, click here. --Fox 13 Salt Lake City is reporting that, " Search and rescue crews responded to Little Cottonwood Canyon after a rock climber fell about 50 feet while rappelling Saturday." To read more, click here. --Boston.com is reporting that, "Authorities are investigating the death of a skier who was found unresponsive near an intermediate trail at the Mount Sunapee Resort in New Hampshire." To read more, click here. 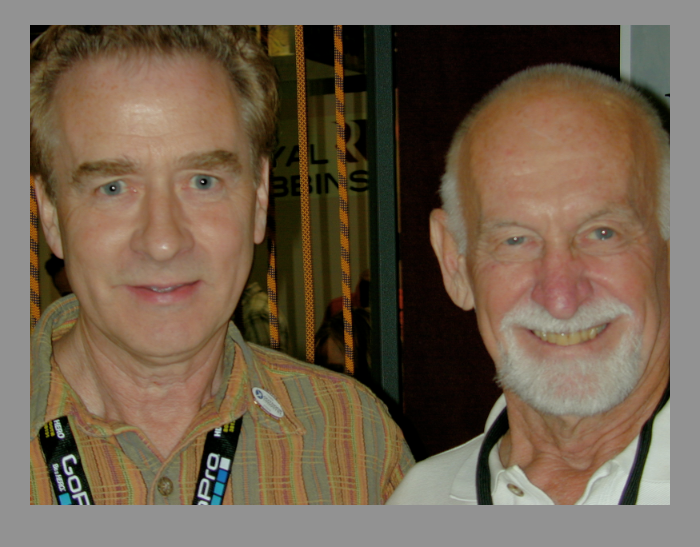 --Rock and Ice is reporting that, "The Access Fund has announced its 2016 Menocal Lifetime Achievement Award, Bebie Leadership Award and Sharp End Awards. These annual awards recognize individuals, organizations, and businesses that "go above and beyond to volunteer their time and efforts to protecting America's climbing." To read more, click here. --A moose in Alaska had to be shot because it charged a ski area lift line! To read more, click here. --If you haven't seen this awesome clip from Bollywood, you should drop everything and watch it right now. --The CBC is reporting that, "A 52-year-old tourist from Austria has been killed in an avalanche north of Revelstoke, B.C. The man was with a heli-skiing outfit about 100 kilometres north of Revelstoke in the North Columbia region of east-central British Columbia." To read more, click here. --CTV New Vancouver is reporting that, "The man who died in an avalanche near Whistler on Saturday is being identified in a memorial group on Facebook as Corey Lynam. Friends and family members are sharing pictures and memories of Lynam, his wife, and young son on the page. A GoFundMe page has also been set up to build a “legacy fund” for Lynam’s son. The page had raised more than $11,000 as of Sunday night. To read more, click here. --TV News Vancouver is reporting on a backcountry avalanche that took place near Cypress Mountain. "A pair of backcountry skiers were caught in an avalanche on Saturday afternoon, and rescuers said one was taken to hospital after spending roughly five minutes buried under the snow. North Shore Rescue Team Leader Mike Danks told CTV News only one of the pair was buried. The other was able to dig him out with the help of another group of skiers that happened to be nearby." To read more, click here. --There was a snowmobile avalanche fatality on the east side of the Cascades this week at Hawkins Mountain near Cle Elum. --A skier broke his leg in an avalanche on Saturday near Alpental Ski Area in Snqualmie Pass. To read more, click here. --The Mono County Search and Rescue team is looking for new members. To learn more, click here. 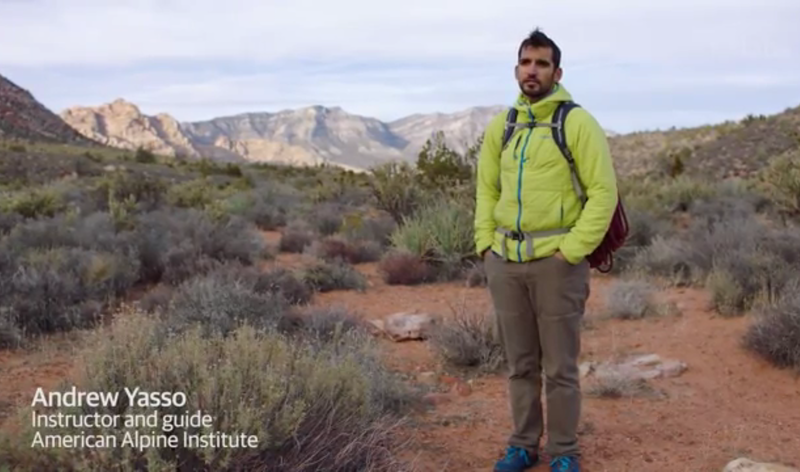 AAI Guide Andrew Yasso talking about Red Rock Canyon to The Guardian. --The Guardian recently did a piece on Red Rock Canyon. AAI Guide Andrew Yasso is featured in the video just over a minute into it. To see the video, click here. --Patagonia and Google 360 teamed up to make an awesome interactive video about Bears Ears National Monument. To see it, click here. --The Aspen Times is reporting that, "A 23-year-old mountaineer missing for two days after attempting to climb Pyramid Peak and falling nearly 1,500 feet was found alive late Tuesday afternoon, authorities said." To read more, click here. --A father and son were caught in an avalanche while cross country skiing near Helena, Montana on Monday. To read more, click here. --A snowboarder in Alaska is lucky to be alive after triggering an avalanche in the sidecountry at Eaglecrest Ski Area. To read more, click here. --The AP is reporting that, "Six people have died on Vermont's ski slopes this season, an increase over previous years. Three of the deaths involved resort visitors who were killed in accidents: two in crashes into trees, and one after falling into deep snow, according to a review of public records by the Burlington Free Press. Two other skiers died of natural causes on the mountain, and a resort employee was killed in a workplace accident." To read more, click here. --The Idaho State Journal is reporting that, "Emergency responders were able to rescue a 61-year-old Idaho Falls man who suffered a heart attack while backcountry skiing in Grand Teton National Park on Friday. Mike Connolly was skiing with family members and friends when he began experiencing significant chest pains. He was listed in good condition at Eastern Idaho Regional Medical Center in Idaho Falls on Monday." To read more, click here. --USA Today is reporting that, "Forest Service law enforcement officer Brad Treat was fatally mauled by a grizzly bear after accidentally surprising and colliding with the animal while mountain biking, the Board of Review Report has determined." To read more, click here. of our public lands have been introduced to Congress." Climbing. --Climbing magazine has published a great article on how we can help defend our public lands. To read the article, click here. --Jeff Lowe -- the inspirational climber that made the first ascent of classics as varied as Bridal Veil Falls in Telluride, to Moonlight Buttress in Zion -- has received the 2017 Piolet d’Or Lifetime Achievement Award. To read more, click here. --The newly confirmed Secretary of the Interior has a mixed record on public lands. To read an article on this topic from the Access Fund, click here. --Outside Magazine has an article up about snow making machines that emit less greenhouse gasses and operate when the temperature is above freezing: "Climate change is ravaging the $12 billion ski industry. The Natural Resources Defense Council estimates reduced snowfall has cost businesses a full $1 billion in the last decade. Snow machines, as a result, have become a necessary stopgap. But manmade snow is a bankrupt solution for this anthropogenic problem. Not only is the process weather-dependent—temperatures must be freezing for machines to work—but, critically, the thousands of snow machines that buzz all winter long use a tremendous amount of energy. Up to half of all the energy consumed by ski resorts now goes to making snow, NRDC estimates." To read more, click here. --The Tacoma News Tribune has run an interesting article about a ski instructor who impaled his face on a tree. To see the article, click here. 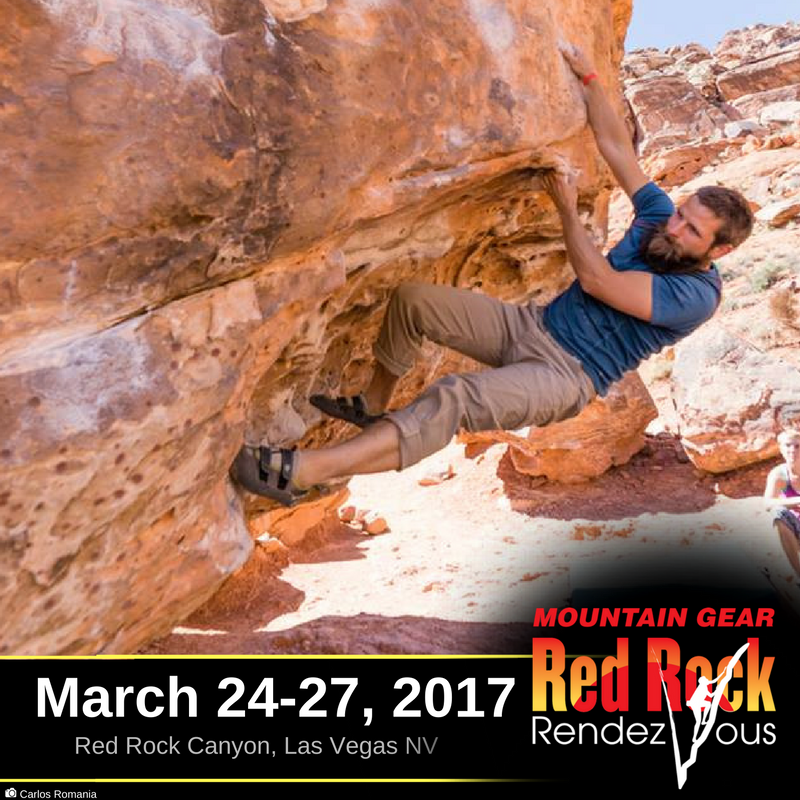 --Rock and Ice is reporting that, "Canadian climber Nathan Kutcher has established what is likely the hardest mixed route in Alaska and a contender for the most difficult mixed climb in North America. His new route, Contra, ascends a near featureless, overhanging rock face in Keystone Canyon outside of Valdez." To read more, click here. In the mid-nineties when I was teaching high school and trying to climb every weekend, I began to notice something. I was teaching at an inner city school with an incredibly diverse classroom, but then I was recreating in a place that wasn't diverse at all. It's no secret that the bulk of those who participate in outdoor adventure sports are caucasian. And while most of us know a few minorities that participate in climbing and skiing, the percentage of those who participate in these sports are miniscule... There just aren't that many minorities playing in the mountains. And that's where James Edward Mills starts in his excellent book, The Adventure Gap. 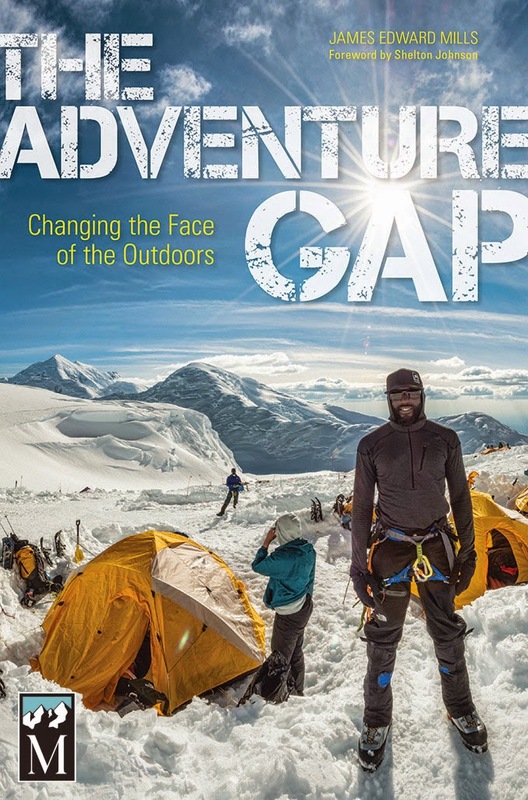 The "adventure gap" is a term Mills coined for this lack of diversity in outdoor adventure sports. As a black man and a writer for several outdoor magazines and newspapers, he has spent a large part of his professional career writing about this gap. And though Mills profiles several African American outdoor adventurers, the bulk of the book focuses on a single expedition. In 2013 a group of African Americans set out to be the first all black Denali summit team. Their expedition was aptly named, Expedition Denali. At 20, 320 feet above sea level, Denali, also called Mount McKinley, is the loftiest perch in the United States. As one of the so-called Seven Summits -- the tallest peak on each continent -- Denali is a much-valued prize on most climbers' bucket lists. Both physically and metaphorically: if you can succeed on Denali, you can likely succeed anywhere. By summiting this high mountain, the members of the Expedition Denali team wanted to show that people of color -- African Americans in particular -- do in fact have a place in outdoor recreation. The objective was to inspire a new generation of minority youth to seek out and enjoy a relationship with the natural world where they might come to play, pursue career opportunities, and fight for its long-term preservation. Like most climbing expeditions the summit was not the sole goal. 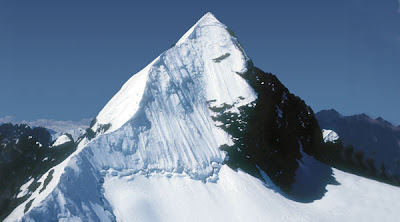 And for this expedition in particular, the ascent to the summit would be only the first step. The journey would continue for climbers back home in their communities, where each team member would be responsible for sharing their experience and offering encouragement to those around them who aspire to a life of adventure. The expedition was composed of a number of people from different backgrounds. Some of those on the trip had significantly more mountain experience than others. But they all were aware that putting together a team of African Americans for a Denali climb was something different, something that had not been done before. A point aptly made in the book's narrative is that the opportunity for people of color to participate in mountain sports often simply isn't there. Perhaps the best anecdote in the book revolves around a young climber on the team by the name of Erica Wynn. The story picks up as she pokes around in a library full of mountaineering books. As she perused the volumes before her, Erica was reminded that many of these stories were dominated almost exclusively by the adventures and exploits of white men. Young people are exposed to many narratives, and Erica felt strongly that these stories shape our expectations of ourselves and of our lives. It's problematic if we're exposed to a single story and we can't identify ourselves in that story. Like so many young children, Erica had grown up in a culture heavily influenced by Disney movies and found herself unable to relate to the characters in those stories. The white woman in those movies always gets the happy ending and she rides off with her Prince Charming, she thought. Where is my place? My happy ending? Erica thought of what little black girls would make of the mountaineering stories like those in the library. They'd think they didn't have a place, or that the odds were stacked against them. She knew that Expedition Denali could help change that. It could add a new story and in that way, help women identify themselves in the outdoors in a way they were unable to in the past. African American comprise only a small percentage of people who routinely spend time in nature. Low rates of participation among people of color in adventure sports such as backpacking, rock climbing, downhill skiing, and mountaineering suggest troubling prospects for the future. Very few blacks join environmental protection groups such as the Sierra Club or The Wilderness Society. And an even smaller number can be counted among the corps of professionals in careers dedicated to the preservation and conservation of nature, including national park rangers, foresters or environmental scientists. It's estimated that by 2042, the majority of US citizens will be nonwhite. Which begs the question: What happens when a majority of the population has neither the affinity for, nor a relationship with the natural world? At the very least, it becomes less likely that future generations will advocate for legislation or federal funding to protect wild places, or seek out job prospects that seek to protect it. What happens indeed? It seems to me that Mills has thrown down the gauntlet for those of us who love the wilderness. How will we promote outdoor adventure to people of color? How can we get more diverse people into the mountains? How can we protect the future of the lands that we love...? As people progress into leading, they think about many elements of the sport. They think about how to place gear. They think about falling. They think about where they might stand while they get a piece. What many new leaders -- and some seasoned climbers -- forget to think about is how they're going to clip the rope to the protection. In the following video Climbing magazine's Julie Ellison discusses how to appropriately clip the rope into a draw and explains some of the dangers that you should be aware of while clipping. There are a couple of things in this video that Julie discusses quite quickly. Following is some additional information on these topics. A quickdraw should aways be clipped away from the direction of the climb. In other words, both the gate on the bolt and the gate on the bottom carabiner should be oriented away from where you are actually climbing. If you are clipping to the right of your body and will be climbing up left, then the gates should face right. If you are clipping left of your body and you are climbing up right, then the gates should be facing left. A draw with the carabiners facing the same direction. Occasionally, you can't tell where the climb is going. In these cases, you just have to make your best guess. There are two reasons for why we orient the gates away from the climb. First, we want the rope to run over the spine of the bottom carabiner. This will keep the rope from accidently coming unclipped in the event of a fall. Occasionally, the rope will run over the gate perfectly during a fall and become unclipped, which could have catastrophic consequences. Second, there have been occasions when the carabiner on the bolt has become unclipped. While rare, orienting the carabiner away from the line of the climb decreases the likelihood of this happening. If you poke around online, you'll find several of occasions where this has happened. The loose carabiner should always be on the side that you intend to clip to the bolt. The carabiner in the tight side of the draw should always be the carabiner you clip your rope to. It's not a bad idea to use the same carabiners every time in the same positions. Carabiners that are bolt carabiners develop tiny groves and inconsistencies in the metal. These can damage your rope. Carabiners that are rope carabiners are in the tight spot so that it's easier to clip them. The lack of rotation in the draw makes it easier to clip while at a funky stance. Each year to protect raptor nesting sites, Rocky Mountain National Park officials initiate temporary closures in the Lumpy Ridge and Sheep Mountain areas of the park. To ensure that these birds of prey can nest undisturbed, specific areas within the park are closed temporarily to public use during nesting season and monitored by wildlife managers. All closures began on March 1 and will continue throughJuly 31, if appropriate. These closures may be extended longer or rescinded at an earlier date depending on nesting activity. Closures include Checkerboard Rock, Lightning Rock, Batman Rock, Batman Pinnacle, Sundance, Thunder Buttress, The Parish, Alligator Rock, Sheep Mountain, and Twin Owls, Rock One. These closures include the named formations. 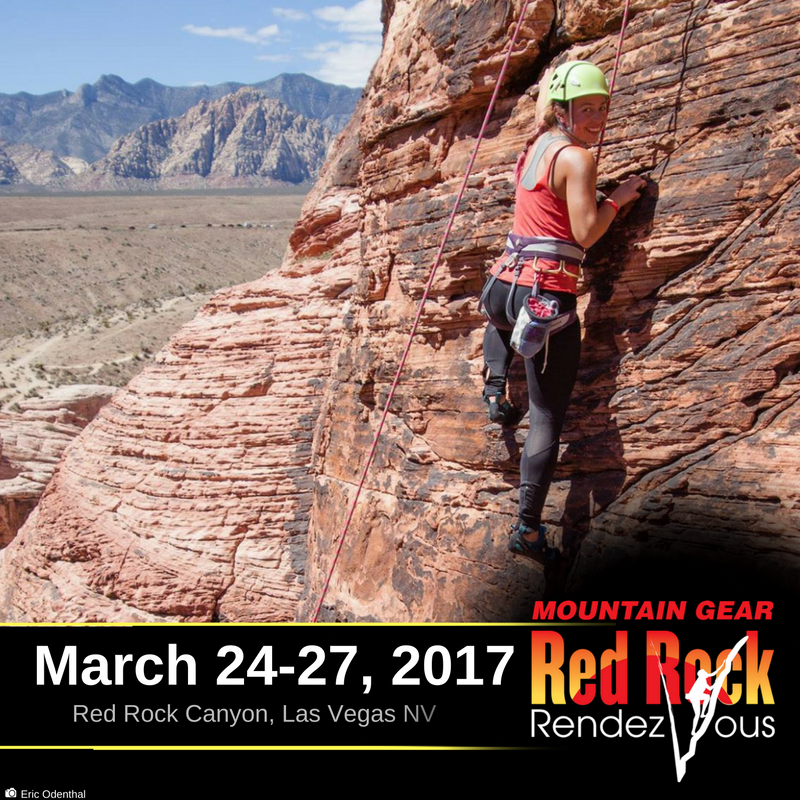 Closures include all climbing routes, outcroppings, cliffs, faces, ascent and descent routes and climber access trails to the named rock formations. Check the park’s website at www.nps.gov/romo/planyourvisit/area_closures.htm for updated information on raptor closures. The National Park Service is committed to preserving birds of prey. The same cliffs that are critical for raptors also appeal to climbers. The cooperation of climbing organizations and individuals continues to be essential to the successful nesting of raptors in the park. For further information on Rocky Mountain National Park, please call the park’s Information Office at (970) 586-1206.